Brambles in Stoulton sleeps 2 people. 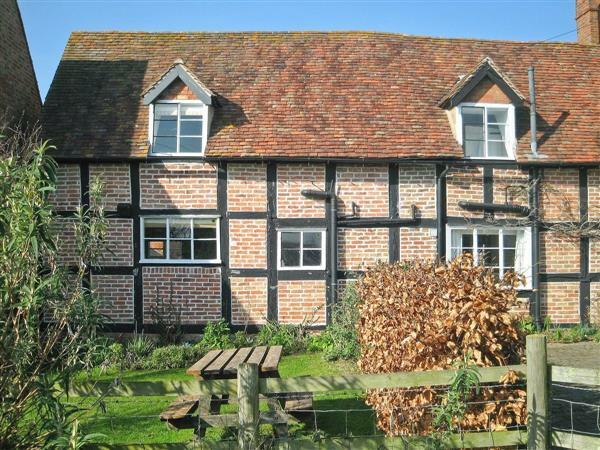 This pretty timber-framed holiday property makes an ideal romantic hideaway, set in the peaceful fruit growing Vale of Evesham, midway between the Cotswolds (Broadway 15 miles) and the Severn Valley. Attached to the owner’s 17th-century farmhouse home, it offers very comfortable accommodation with its own sunny garden. The market town of Pershore (3 miles) offers a wide range of facilities. An excellent holiday base for touring with the cathedral city of Worcester (6 miles), The Malverns (12 miles), Stratford-upon-Avon (25 miles) and Cheltenham (25 miles). Farm shop ½ mile. Shop 1½ miles, pub/restaurant ½ mile. Beamed living/dining room. Farmhouse-style kitchen. Steep stairs to first floor: Double bedroom with 5ft bed and sloping ceiling. Bathroom with over-bath shower and toilet. For a better idea of where Brambles is, you can see Brambles on the map below. Brambles is in Worcestershire; should you be on the lookout for a special offer, you can find all the special offers in Worcestershire. It's always worth checking to see what is on offer at the moment. Do you want to holiday near Brambles (NRA), you can see other cottages within 25 miles of Brambles; have a look to find your perfect holiday location.